Growing in the cloud forests of New Caledonia is a shrub, Amborella trichopoda, that occupies a pivotal place in the evolutionary history of flowering plants: In the flowering plant tree of life, Amborella trichopoda belongs on the lowest branch. In fact, Amborella is is the last living member of this most ancient lineage (i.e., the genus’ single species). Because of Amborella‘s evolutionary position, its genome promises to help scientists investigate some of the more enduring questions regarding plant evolution. The Amborella Genome Project is a 7.3-million dollar, 5-year-long project to sequence Amborella trichopoda’s genome. Funded by the NSF Plant Genome Research Program, the Amborella Genome Sequencing Project aims to generate a high-quality draft genome sequence for Amborella trichopoda, the earliest diverging species on the flowering plant tree of life. The benefit of having a map of Amborella’s genome is that it can help answer questions about the evolution of important genes and genes families, which will further our understanding of how flowering plants came to dominate the world’s ecosystems. The annotated map will be available on the Amborella Genome Project’s webpage for use by researchers in their work in plant biology. Funding the project is the NSF Plant Genome Research Program. 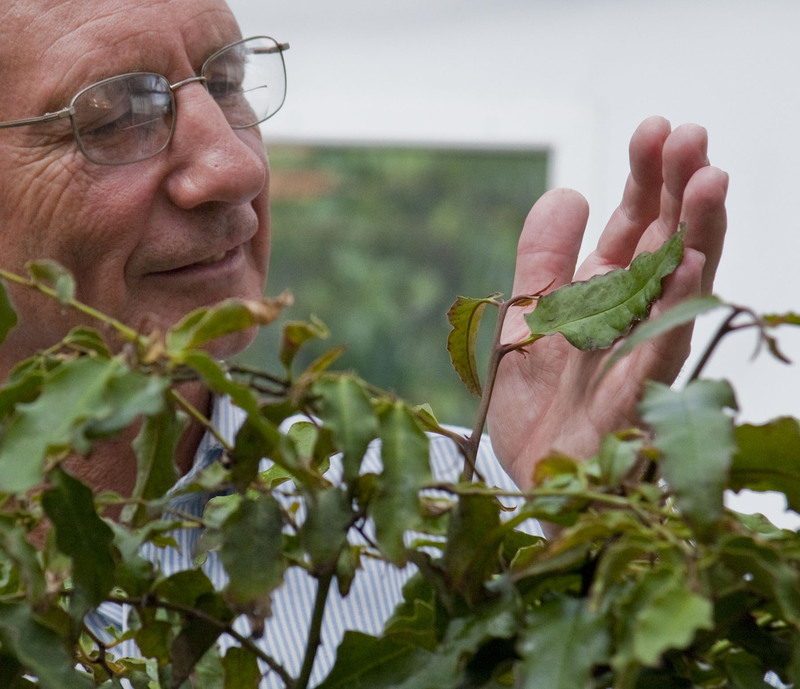 University of Florida biologist Douglas Soltis with Amborella trichopoda specimen in the Florida Museum of Natural History greenhouse. The large shrub found only on the South Pacific island of New Caledonia is the closest living relative of the earliest flowering plants. Photo Jeff Gage, Florida Museum of Natural History. Mapping a genome means identifying all of its genes and producing a physical map of where they appear in the genome. This is done by smashing the genome into bits and then identifying and mapping those bits. Scientists like Professor Brad Barbarzuk at the University of Florida’s Genetics Institute uses a method called Shotgun sequencing. This method is considered a next-generation approach because it produces sequence data at a rate one thousand times faster and many times cheaper than more traditional sequencing techniques. To help identify sections of DNA, researcher Andre Chanderbali painted areas of Amborella chromosomes with different colors to mark their location. The header image on this page was made by Chanderbali and shows 4 marked DNA locations, each in a different color. The identified and mapped genes serve as landmarks that allow researchers to compare Amborella’s genome with the genomes of other flowering plants. 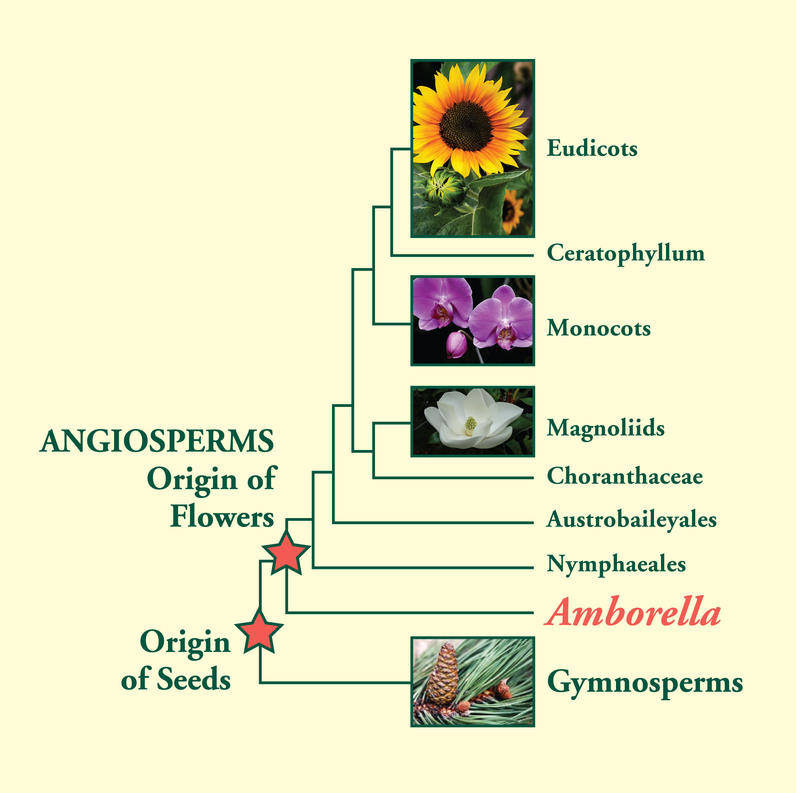 In this way, Amborella‘s genome serves as an evolutionary reference point for interpreting differences between different groups of flowering plants. Pam Soltis, Distinguished Professor and Curator of Florida Natural History Museum, is a Co-PI on the Amborella Genome Project. Why Amborella? Botanists and other kinds of biologists have spent many years constructing and refining the flowering plant tree of life. The most difficult part of the tree to pin down are the lowest or most basal branches on that tree. These branches represent the plant lineages that were earliest to evolve. In terms of living plant lineages, there were many candidates over the years, and no one seriously suspected that Amborella might belong on the lowest branch. While on sabbatical at the Smithsonian Institute, Pam and Doug Soltis were running analyses of the DNA of various plants. In the freezer was a little tube of Amborella trichopoda DNA, and almost as an afterthought they included it in their analyses. Subsequent tests repeatedly showed that Amborella indeed represented the basal-most branch of flowering plants. Where did flowers come from? Where did all these flower plant lineages come from? Why were flowering plants so successful? What allowed for such a rapid diversification and radiation (spread) of flowering plants into nearly every ecological niche? What did the first flowering plant look like and what was in its genetic make-up? How did the ancestors of flowering plants develop the traits that have come to define flowering plants? How did the genes and gene families that determine flowering plant traits evolve? Did they come from existing gene families? What role did genetic mutation and whole genome duplication have to play in the “big bang” in flowering plant evolution? The database of the annotated map provided by the Amborella Genome Project allows researchers to more deeply investigate some of these questions. Meet the Scientists! You can watch Amborella Genome Project scientists talk about their work in the following videos.